Something about Tom Brady was different. New England sports diehard Jerry Thornton realized this when the cover of the February 18, 2002, edition of People magazine caught his eye. "Why I Had Plastic Surgery" blared the big-blocked letters. But it wasn't Greta Van Susteren featuring her new "talk of TV" look that grabbed his attention. Thornton was fixated by the top right corner: a space occupied by a visor-wearing quarterback who until now had been a pop-culture anonymous. "Those lips, that chin, that Super Bowl win!" read the accompanying tease with Brady's photo. If Celtics icon Larry Bird had gotten a "That wispy mustache, those tiny shorts—the best in sports" treatment, Thornton couldn't recall. Those innocent times may seem foreign to a generation of football fans sick of seeing Tom's mug plastered anywhere and everywhere. But in 2002, things were changing fast for a Patriots franchise that spent its first 40 years as "the most amateurish, dysfunctional, and mismanaged in all of sports." They were now world champions. Their new beginning was blissful, but the price of fame began lurking in the blindside—waiting for an opportunity to blitz. What if I told you the nasty things you've come to believe about the fellas from Foxboro were distortions? If interested in enlightenment, Five Rings: A Super Bowl History of the New England Patriots (So Far) is a turducken tale for you. It stuffs an investigative thriller into a gushing hagiography into a historical accounting that chronicles the Patriot metamorphosis from lovable loser to object of national contempt, eclipsing the late-90s New York Yankees. 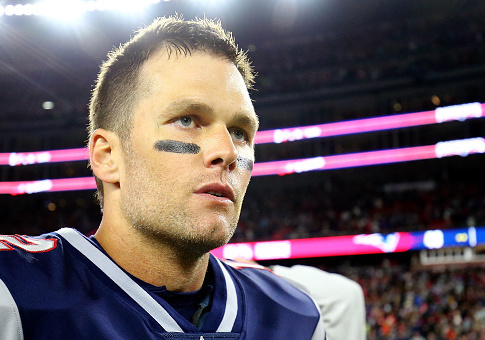 Jerry Thornton flips the script to outline his truth: Tom Brady and Bill Belichick are not villains—they're victors who never embraced victimhood. The Rings saga covers the cost of prolonged excellence: scandals, battles against an adversarial media, politicized investigations, jealousy, betrayal, pride, lust, envy, wrath, greed, and sloth. Thornton's 129,000-word tome pairs primary sourcing with partisanship to examine why minor-speeding incidents were treated as White Ford Bronco chases, and how wrist-slapping infractions became trials-of-the-century. It's an epic myth-busting exercise: Spygate, Deflategate, and an innumerable amount of "dark web crackpot conspiracies." As you turn the pages, news junkies will notice storyline similarities between pigskin scandals and those that exist(ed) in the political arena. Interpret those through any filter you find appropriate. The success of the team rides parallel tracks alongside a media evolution and the personal journey of a dude from Weymouth who used a blogging side gig to morph into an authority on Patriots affairs. Barstool Sports began as an alternative publication with modest readership in the greater Boston area. It is now a nationally read, at times controversial, content machine that feeds a bro-leaning audience a diet of "sports, pop culture, celebrities, beautiful women, and irreverent humor." But in an earlier epoch with Thornton as one of the original "core four," The Stool was more notable as Patriot Nation's vox populi. The team's newfound winning ways put tenured scribes who viewed the coach as "arrogant, megalomaniacal, duplicitous, pond scum" at odds with a fanbase who revered their guru in the hoodie-sweatshirt with cut-off sleeves and the not-quite-yet UGGs billboard model at quarterback. Barstool found the "theaters of passive aggressiveness" of Belichick's press conferences to be "legendary." But Bill's message control drove legacy media mad. It fueled a "[#]resistance among the old-school press [who] were operating off the old model where [they] made reputations." Reflecting on Barstool's mentality, Thornton posits a Trumpian theory: "There's usually no better way to fire up your fan base than going to war with the media." So Barstool did. Bret Hart would have been proud of the typographical sharpshooters deployed against critics of the Patriot Way. I'd suggest a political lens to understand the bad blood between battling entities: It's Barstool and New England Fans vs. NFL and the media. For #MAGA voters Commissioner Goodell is Robert Mueller, Brady is Trump, and ESPN is CNN. If you were #WithHer, Goodell is October 2016 James Comey, Tom is Hillary, and ESPN is Breitbart. The league was accustomed to franchises having dominance spurts: 1970s Steelers, 1980s 49ers, 1990s Cowboys … but eventually each gridiron Eden sank to grief, as nothing gold can stay. New England's refusal to embrace losing made them guilty of committing "the unpardonable sin" in 21st century sports: not going away. Their continued victories made parody of the league's prided parity. A turning point arrives when the wicked winds of "Spygate"—an attempt to say "signal stealing" was the reason the Patriots were winners—set their sights on Foxboro. Fed up with Patriot Way gospel, media elites and jealous rivals recast the now three-time Super Bowl champs as the "cheatingest cheaters who ever cheated." Spygate "gave the fan base a cause, something to push back against." Sounding more Ace Ventura than Eliot Ness, Thornton navigates exculpating evidence. You meet Michael Cohen-esque snitches like Eric Mangini. At the end of the chapter it's clear that even though the Patriots were doing what defeated nemesis Bill Cowher said everyone was doing, they are held to a different standard. As accusations blitzed the Patriots, the team adopted an "Us vs. the World" mentality and took their vengeance by showing opponents no mercy. "If the other 44 states were going to treat New England like the bad guy," then Barstool would embrace a "full wrestling heel … pounding your hero into the mat, then stealing his girl" attitude. Stoolie devotion hit Branch-Davidian levels, as disciples regurgitated talking points from the blog. Thornton pridefully notes that the effort successfully changed the conversation from "why do [the Patriots] cheat?" to "why are they running up the score?" Spygate primed Barstool's blogging beasts to "defend the wall" against the greatest offense the team had faced: "Deflategate"—another attempt to undermine the franchise's accomplishments by conflating success with cheating via "underinflated" footballs. A special counsel probe ensues. Thornton forecasts the troubles ahead by ominously asserting: "Witches don't exist, but witch hunts always manage to find them." You learn the genesis of the league's beef with Brady, characters denying collusion only to see those claims later contradicted, athletic deep-states exposed, and protagonists forced to publicly deny charges about events that never happened. You also understand how investigators with alleged motive operate. With the benefit of hindsight, Thornton aggregates headlines of grave sin that were quietly cleaned up with fine print retractions—but the bemoaning author knows that some bells just cannot be unrung. And we learn an inconvenient truth relevant to anonymous sourcing: Just because a reporter reports something that someone told them doesn't guarantee that claim is fact. Rings showcases activist press power. Thornton invokes The Wizard of Oz to describe Stoolies as "winged monkeys flying out of the witch's castle" attacking anyone who questioned Brady's integrity. Bill Nye "The Science Guy" is among the many not spared this wrath. The most telling anecdote involves the NFL's second-best quarterback: Aaron Rodgers. In 2014, the Patriots played the Packers, and there's a moment that stood out to Thornton: "A bit of harmless fun, forgotten as soon as it's mentioned"—or maybe selective amnesia. The broadcast team discusses "how laser-focused" Rodgers is about preparation. He likes to pump the pigskin up even above the legal limit (! ), the TV audience was told. He just hopes the officials don't notice, the talkers added. Oh. Rodgers's ball-preference boast is a testament to dedication—not even a misdemeanor. But Brady's alleged deflation is treated as high crime. The exasperated author notes that Tom's affair turns into a legal drama that takes him "one level of the federal justice system away from the Supreme Court!" The examined hypocrisies get lost in the national narrative. The around-the-clock coverage results in Brady deadpanning: "This isn't ISIS." Belichick even cracks a joke, referencing My Cousin Vinny while proclaiming innocence. Spoiler: Using highly regulated footballs Tom shatters a Super Bowl passing record against one of the most vaunted defenses of all-time. At the White House celebrating Lombardi Trophy IV, President Obama reflects on the outrage: "That whole story got blown out of proportion." But not even that presidential proclamation could quell the hysteria. Nearly 20 years and five Super Bowl championships later, the Patriots show no signs of slowing down. With a 41-year-young QB under center, they are poised to make another title run. The book highlights their adversity antidote: focusing on what they can control by doing their jobs. And winning. Winning so much it makes the rest of the league sick. When reading Rings you will appreciate, fear, or find your taste somewhere in between while digesting the democratization of media. You'll follow the journey of ragtag pundits who achieve such cultural relevance that the NFL pulls their Super Bowl press credentials! Barstool may have been permitted entrance at 1600 Pennsylvania Ave., but not at an athletic radio row. At its core, Rings is a study of how putting it all on the line to pursue a passion can lead to personal greatness. By taking risks, Jerry Thornton finds himself a twice-published author of books on a team he spent his life fanboying. He keeps his perspective honest, highlighting his "walk through the Gates of Hell covered in Sterno" bias for Belichick—not hiding it. But Thornton doesn't make excuses while adjudicating his team's reputation: When they win it's because they were better than their opponent; when they lose it's because they were not. He's also not shy about sharing his own analytical fallibilities, like that time he dubbed Aaron Hernandez "The Perfect Patriot." His membership in the Gillette Stadium Night's Watch is rewarded when he gets to interview the coach: "Jerry, it's an honor to finally meet you." A clear juxtaposition from the "f— you!" Belichick gives to a request for an on-camera convo to a prominent TV personality. Rob Lockwood is a former Republican communications strategist and avid New England Patriots fan. He is an adherent to Bill Belichick's avant-garde fashion instincts.